One Eternal Day: "To criminate and recriminate"
The introduction to the letter included this information. Burke and Johnson were contemporaries and friends. 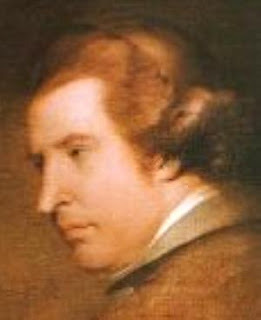 Burke was one of the few men whom Dr. Johnson respected as equals. He said: "Burke is the only man whose common conversation corresponds with the general fame which he has in the world. Take up whatever topic you please, he is ready to meet you. ... He does not talk from a desire of distinction, but because his mind is full. ... He is never what we call hum-drum; never unwilling to begin to talk, nor in haste to leave off." When Burke with other friends came to bid farewell to Johnson on his death bed, he expressed a fear that so many callers might oppress the sick man. Johnson replied : "I must be in a wretched state, indeed, when your company would not be a delight to me." I read Burke's "Letter to the Sheriffs of Bristol" after reading "Navigating Political Strife and Unrest With Edmund Burke" in the Weekly Standard.